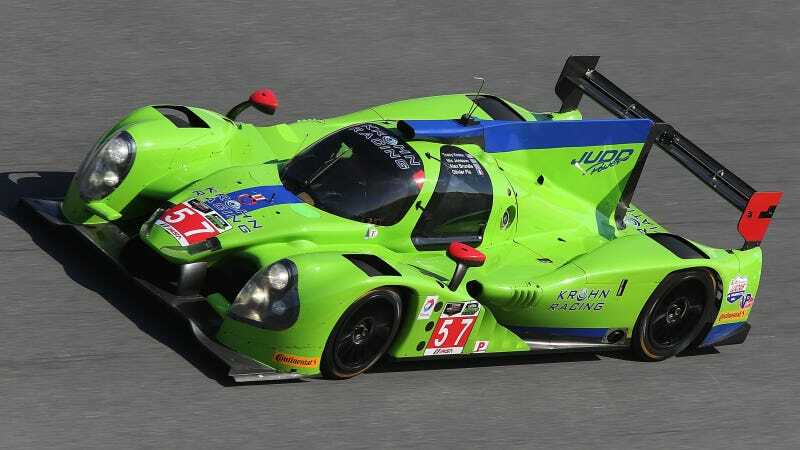 The absolute greenest (look at it, man) car on the grid won pole for the 12 Hours of Sebring: the number 57 Ligier JS P2 Judd of Krohn Racing. Olivier Pla put down a stonking fast lap that put Kermit's race car on pole. Krohn just started racing the JS P2 this year, having switched from last year's Ferrari 458. This is the first overall pole Krohn Racing has won in the new TUDOR United SportsCar series, however, the Daytona Prototype they used to run in Grand Am before the series was merged won the big pole several times. This car didn't do so well at Daytona, but that didn't matter today. Team owner Tracey Krohn said that Pla told him "Yeah, the car's really good" in testing. The car was consistently at the top of the times in practice sessions, too. Krohn and Pla share the car with Nic Jonsson. Only a little over three seconds separated them from the Extreme Speed Motorsports prototype (which is ESM's Honda HPD ARX from last year!) that claimed the second grid spot, though, so expect P2 to be a close race for all twelve hours. Who knew last year's car could be so fast? In other class news, GTLM saw the thirteenth different winner in thirteen years of running the class at Sebring. The factory #912 Porsche 911 claimed that spot. TI Automotive's #33 Dodge Viper claimed the GTD class pole, and BAR1 Motorsports' #16 car claimed the PC class pole.